Glen Raven created an upholstery version of Sunbrella® fabrics in the early 1980s, and today Sunbrella is the leading premium fabric for casual and outdoor furniture. Durability, fade resistance, name recognition, ease of cleaning, comfort and beauty have made Sunbrella the asked-for brand when it comes to patio, deck and outdoor room furniture and fabric accessories. Their Sunbrella design team works with the nation’s leading home décor companies in creating Sunbrella fabrics that are exclusive to their specific brands and designed for specific target audiences. We also offer specialized versions of Sunbrella upholstery fabrics, including Sunbrella Strap, Sunbrella Terry Cloth and Sunbrella Rope. 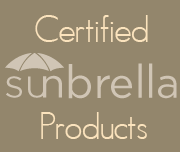 We are one of the largest online distributors of Sunbrella Fabrics. You can order Sunbrella Fabric By The Yard at our site. Sunbrella Fabric – Outdoor living at its FINEST.